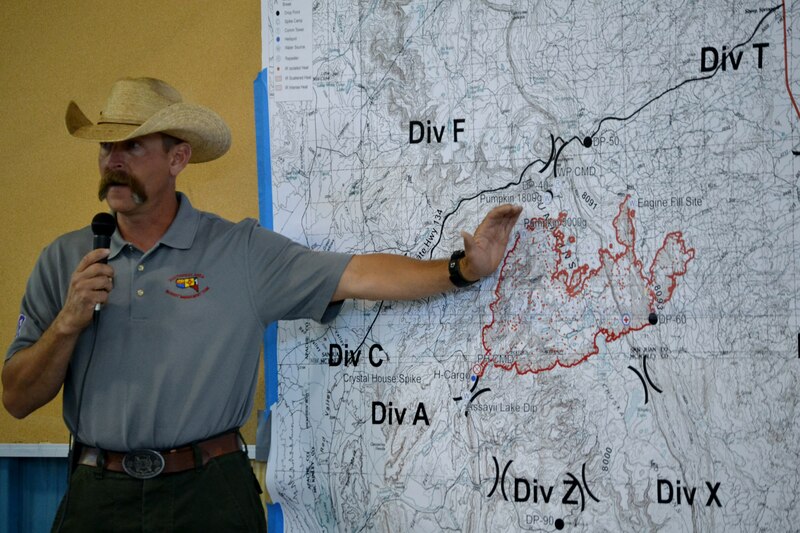 During the June 19, 2014, morning fire briefing at the Tse Hootso MIddle School “Tin Building” in Fort Definacne, Ariz.,, Southwest Incident Management Team 3 Operations Chief Todd Abel reported that the winds had calmed down enough yesterday for air tankers and helicopters to drop fire retardant and water on the Assayii Lake Fire. The evening fire report showed that the Assayii Lake Fire was 20 percent contained. Photo by Marley Shebala. The Assayii Lake Fire is at 20 percent containment. That’s according to a June 19, 2014, EVENING FIRE REPORT from the Southwest Incident Management Team 3. And the fire is also at 13,450 acres, which is only a growth of two acres since this morning’s fire briefing at the Tse Hootosi Middle School “Tin House” in Fort Defiance, Ariz., at 9 a.m. and a MORNING FIRE REPORT that was released after the briefing. YouTub Video “Day 7 – Assayii Lake Fire “largest fire” on the Navajo Reservation”, which is a recording of the June 19, 2014, morning fire briefing, is also available for viewing. Sullivan reported that the DC-10 air tanker, which he described as “relatively new,” holds 11,000 gallons of fire retardant and it made three drops on the fire yesterday. He said that “multiple” other air tankers also made several drops yesterday. Southwest Incident Management Team 3 Safety Officer Marty Cole said that the other hazards of high winds involves the firefighters on the ground. Cole said that he spent yesterday out in the field talking with several of the division chiefs and firefighters and some of the division chiefs told him that the wind was blowing so hard on June 16 that it was actually putting out the fire in some areas. He added that some of the hazards for the firefighters is driving because some of the roads are so dusty and steep and the terrain is also very steep, where the firefighters are working on putting in fire lines by hand, and there’s a lot of “rolling material,” such as rocks. Cole explained that the firefighters have safety standards and one of them is L.C.E.S., which is the acronym for Lookouts, Communication, Escape Routes, and Safety. Escape routes are established by the firefighters as ways for them to get away from the fire in case something occurs, he said. It’s a way out to a safety zone, which is a place where they will be safe as the fire goes by them, over them or around them. Sullivan announced that some fire specialists from Montana are at the Assayii Lake Fire to do a study on safety zones, what is a safety zone, amd how big of a safety zone can be used. They also put instruments in the path of the fire to find out how intense the fire is so they can keep these guys on the ground safe, he said. After Cole finishes his update, Fisk notes that the fire map is from yesterday because as they were printing out today’s map, a power outage occurred. He noted that the fire had grown about 200 acres from yesterday so today’s map wouldn’t show a lot of difference. Navajo Nation Emergency Management Liason Rose Whitehair announced that issues with communications, specifically with wifi, forced the tribal emergency management team to relocate from the “Tin Building” to the Navajo Nation Division of Transporation in Tse Bonito, N.M. The contact phone number for emergency management is 505-371-8416 and 8417. Whitehair said that “due to popular demand,” the tribal emergency office established an “official” Wells Fargo Bank monetary fund account, which is titled “Assayii Lake Fire Relief Fund, with the assistance of Navajo United Way. SWIMT 3 Deputy Commander Roy Hall announced that the Assayii Lake Fire made Navajo history by becoming the largest wildland fire on record on the Navajo Reservation. Hall recalled being on the Navajo Reservation as part of the SW Incident Management Team for the Toadlena Fire, which allowed him to experience the “beauty of the Chuska Mountains” for the first time. The Assayii Lake Fire is also on the Chuska Mountains and in an equally, if not, more beautiful part of the mountains, he said. But Hall said he wanted to point out the factors for how Assayii Lake Fire became the reservation’s largest fire. Weather was a key factor because it’s created a very “dry” period, he said. And when he was out in field yesterday with SWIMT 3 Operations Chief Duane Tewa, the winds calmed down, which allowed the firefighters to reach their target goals. And so Hall said he was also able to witness a lot of “safe and efficient firefighting” but there is still a lot of firefighting to be done. He recalled a question from a community member at another morning briefing, which was about seeing a lot more smoke fire. QUESTION: any safety, health issues with fire retardant? SWIMT 3 Liason Dan Fisk answers no and that all issues were researched and covered. QUESTIONS: there is conflicting information about how many structures/homes have been destroyed by the fire. SWIMT 3 Liason Dan Fisk says that SWIMT 3 met with tribal police and that the official number of structures/home destroyed by the fire is five. This entry was posted in Professional Journal and tagged Assayii Lake Fire, Chuska Mountains, Navajo Reservation, Southwest Incident Management Team 3 by Marley Shebala. Bookmark the permalink.